Lugz is pretty big deal kinda shoes! One day I'd love to have a pair of their sneakers! Do you own any lugz? Do you love winter boots? Share with me and enter to win below! 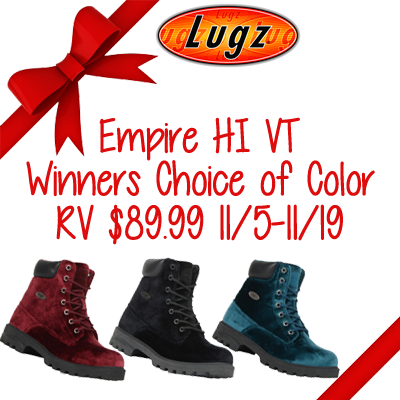 The Empire Hi VT is a water resistant and slip resistant plain toe boot that features our patented Flexastride memory foam technology. This boot features a velvet upper and has the perfect blend of style and comfort to protect your feet year round. I'd love to have the Ruby/Black. Those are nice! How fun that they come in vevlet! My two oldest boys have Lugz boots.